Meet your digital students on their turf. Inspire book discovery and book talk. Students easily share book reviews and recommendations. Effortlessly manage & monitor reading lists and reading challenges. It’s no muss no fuss when your students’ reading logs go digital. This social network is 100% kid-tested & kid-approved. Connect with friends & see which books are popular. Recommend your favorites to everyone. Build your own virtual bookshelf. Raise your kid's reading bar! Find books appropriate for your child's interests and ability. 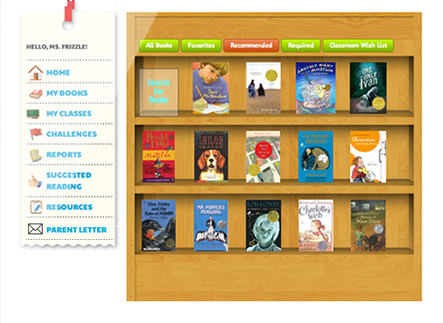 Check class assignments and see your child’s reading list, at any time! Our reading network is safe and secure. Your child’s privacy is our top priority. Explore this virtual community for ages K-8. See how our feature-rich site addresses the needs of this age group and supports independent reading. It’s simple to use. Best of all, it’s FREE! What are Reading Levels and why should you care? Who is Coach Chip Manzee? If you are new to our site, please “Join Us” to use all the features. To see what we offer, select “Learn More” from the top of our home page. And remember … Biblionasium is FREE to Join. I spy 8 kids on Bibionasium. School doesn&apos;t start for 30 minutes. I hear them discussing picture books. 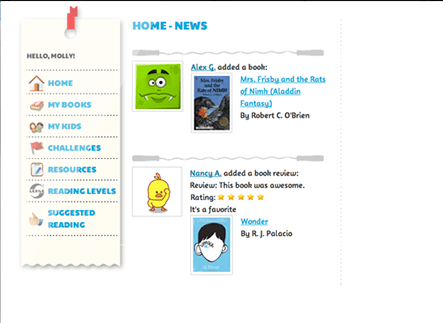 Thanks @donalynbooks — in love with this site — Goodreads for kids with rdg logs, shared shelves & parent access! @Biblionasium love this! Made my heart smile as I watched second graders more excited about reading! After 4 weeks using @Biblionasium our 6th gd tcher reports the % of Ss logging reading minutes in higher then when Ss used paper log. 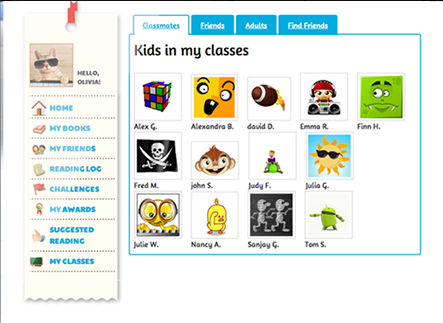 @Biblionasium We&apos;ve added a few more classes from my school. The teachers and students love your site. I used Biblionasium this year and it was GREAT instead of paper logs. I *finally* discovered a Goodreads-style site for kids, called @Biblionasium and my daughters already posting their favorite titles! I love @Biblionasium! 6th grade Students do too! Have you tried out @Biblionasium? My first graders love it! 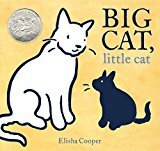 Goodreads/Shelfari type site specifically for kids. @Biblionasium Also, FINALLY got on Biblionasium with my students and they LOVED it! I&apos;ve hardly even seen them so excited. It was to cool! Biblionasium: Named a 2013 Best Website for Teaching and Learning by the American Association of School Librarians (AASL) The 2013 Best Websites for Teaching and Learning foster the qualities of innovation, creativity, active participation, and collaboration. Motivating Independent Reading with Biblionasium One great site that does so many wonderful things! 10 Tools Every Teacher Should Master This Summer ... transform your classroom in the fall ... real-time, collaborate and creative! No. 3 is Biblionasium! NeverEnding Search — Biblionasium: social reading for kids It's safe. It's free. It's fun. It's cool. Biblionasium....An Awesome NEW "Virtual Reading Village" The Third Graders LOVE! So ... pledge to TAKE 20! Reading 20 minutes a day can make a big difference! Read wherever you are. Look around – read things like posters, billboards, signs. Make it fun – pick out books purely for pleasure reading.